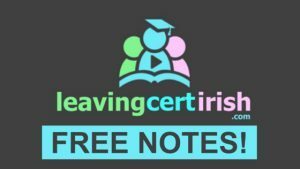 If you want to avail of our regular newsletter that comes with free Leaving Cert Irish Notes please click the link above. You can opt out at any time if you wish. Make sure that you check your junk/spam folder in case the emails turn up there! We want to share some of our best material with you to ensure that you have a free source of outstanding supplementary content. Most of what we do is shared in the form of video tutorials and PDF notes, but you can also access some of our amazing flashcards and written vocabulary tests for free. Please like/share this page with your friends.